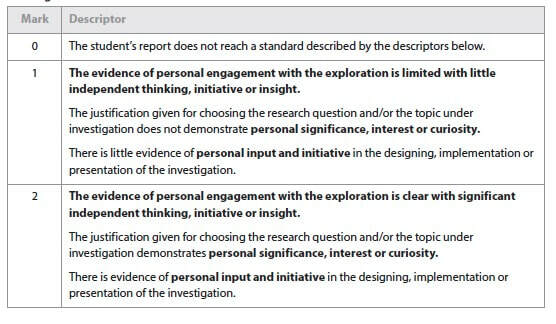 This criterion assesses the extent to which the student engages with the investigation and makes it their own. Personal engagement may be recognized in different attributes and skills; these could include addressing personal interest or showing evidence of independent thinking, creativity, or initiate in the designing, implementation or presentation of the investigation. ​For the personal engagement, criterion, you must provide clear evidence that you have contributed significant thinking, imitative, or insight to your investigation. Personal significance, interest, and curiosity are awarded. Unlike other criteria, in personal engagement there just has to be a point of evidence against an aspect, it does not have to comprehensively meet all mark points. the quality of the observations made.